A 51-year-old otherwise healthy woman presents for follow-up of moderate aortic regurgitation which was discovered three years previously. She had a heart rate of 75 beats/minute in sinus rhythm and her blood pressure was 120/70 mmHg. She had normal carotid pulse, ejection systolic, and early diastolic murmurs. A transthoracic echocardiogram incidentally showed a large (8.0 cm) left atrial mass at the roof the left atrium attached to the interatrial septum. She underwent cardiac surgery with complete excision of the mass. The gross specimen consisted of a gelatinous, somewhat circumscribed mass measuring 7.6 cm maximally. Histopathology demonstrated a hypocellular tumor composed of bland spindle and stellate cells. 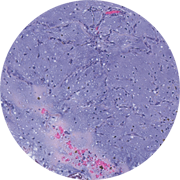 The myxoid background showed blood vessels with scattered hemosiderin-laden macrophages, plasma cells, and lymphocytes. A diagnosis of atrial myxoma was assigned.